In recent months we looked at a number of metagame examples – trading at places where the "the other trader" feels extreme stress or fear. You'll find some of these articles, if you missed them, here, here and here. Today, I thought we could look at another one. Because I just LOVE these setups. Things don't always go according to plan though. If you missed the entry… no problems. Let it go. It wasn't yours to catch. There will be MANY other trade opportunities. Stay focused. In fact… sometimes that next opportunity comes along VERY quickly. 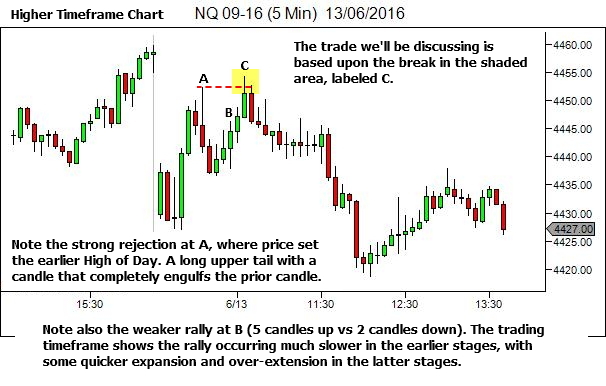 Let's look at an example, a BOF setup on break of the high of day. We'll start with the higher timeframe chart to get some context. 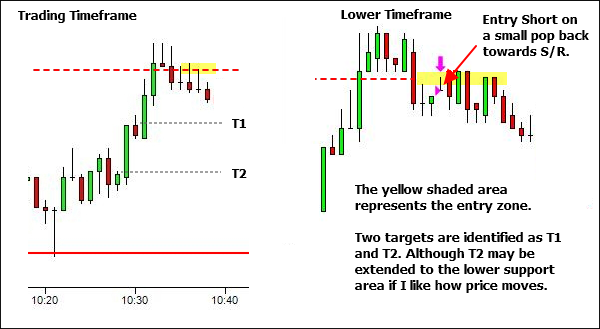 And then move on to the trading timeframe and lower timeframe charts to discuss the trade opportunity. It's messy. But it was effective. Trade opportunity is often found at the places where "the other trader" is making decisions based upon extreme stress. 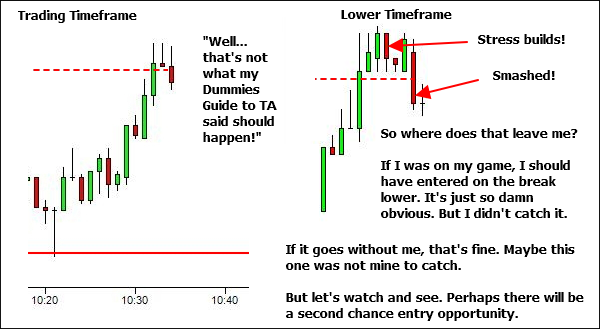 If you miss an entry on initial breakout failure, don't panic and chase. Let it go. But remain alert. 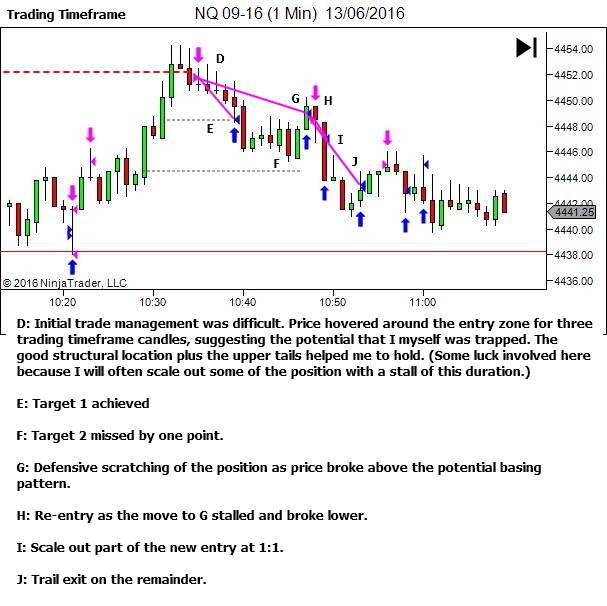 There could be a second chance entry on retest of the point of breakout failure. I love these setups. 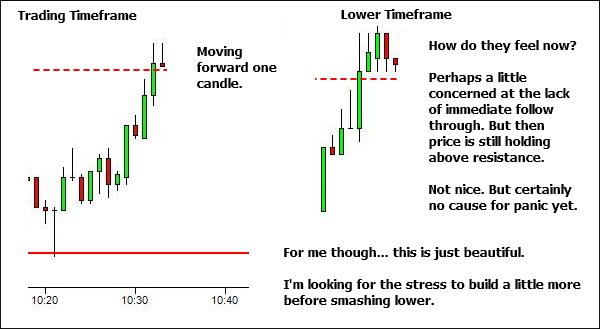 In your first figure (your higher timeframe) I see that (starting from the open, which I assume is marked by the vertical line) the price made a first low, then a first high at point A – right below the previous day high, then after the dip that created a higher low, it took a few candles to get back to the area around A.
I constantly look for things like this: what looks like the beginning of a trend, that appears to struggle (i.e. 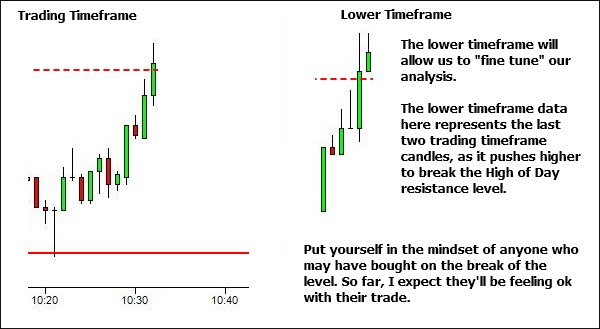 take more than 1 or 2 candles) to get to the next higher high (or low, for down trends), right next to some significant level. As soon as I see weakness (like the red candle at point C in your example), I know that my stop is just above the last peak. I also know that it is VERY likely that the price will spike up one last time, before taking a dive: that last spike (in your example that would be the third candle counting from the one marked as C, in your higher time frame) comes from traders that “go with the trend” and oblivious to the resistance being in the way are “buying on the dip” which is the red candle right at C. When they see (with the following candle) their price basically not budging, the smart ones frantically decide to cut their losses and start getting out – that’s my opportunity to get in, I like to put in a limit sell order right around that area to go with my stop. 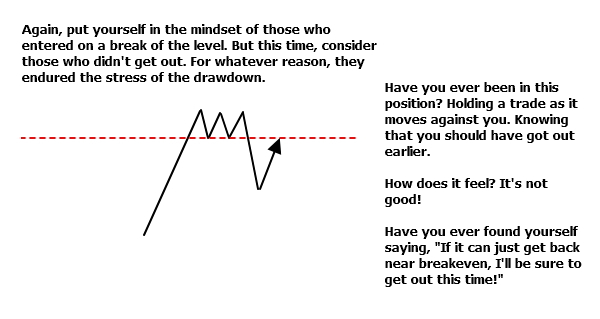 The little congestion that happens after that is also typical, in my experience – that’s the more stubborn traders that have to be “strong bulls” and hold on to their conviction – and position. Eventually they give up, and the true downswing happens. 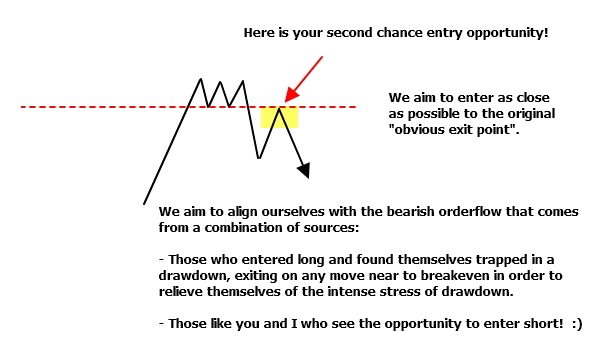 Basically, I’m trying to say that in my experience in spots like these it’s extremely typical that there will be one or two opportunities to get in, so it’s important not to rush things and just maintain the focus on making the best possible decision, without fear that we’ll miss the big move. 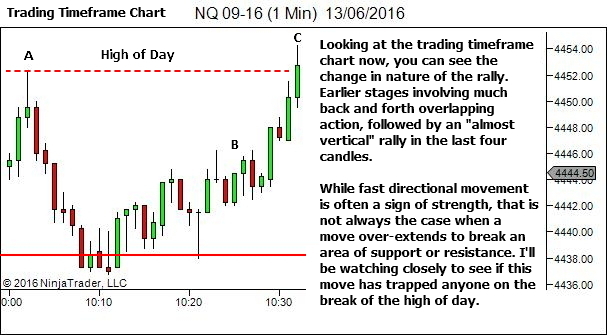 In fact, the longer the congestion just below the level lasts, the bigger the subsequent move is likely to be. So if we miss it because it was too fast, the move won’t last long anyway. Spot on! I love it. Great comment. I’ll just correct one thing. The move up to high point A was not “right below the previous days high”. That sequence from the prior day was just the closing hour or so. The prior day’s high was quite a bit higher, set in the earlier part of that session. But that being said, movement up to A was just short of the previous day’s close. So it’s still an important area. I just felt to say , I too believed your statement,.. Coincidentally , Lance too made the same comment.. Thank you both, for a wonderful topic & discussion.